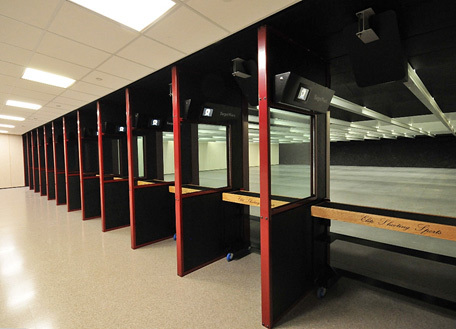 Elite Shooting Sports has four separate ranges that operate independently: two 25-yard 12-lane ranges, one 50-yard 10-lane range, and one 100-yard 8-lane range. The shooting lanes are 48” on center giving the shooter plenty of room to shoot on their own, or enjoy the company of a friend, or an instructor. Also, it makes it easy for folks using a wheelchair, or a scooter. Tables may be removed to make it easy for drawing from a holster unimpeded. Each range is well-lit and equipped with TargetWorx range equipment, THE most state-of-the-art equipment available in the industry. All ranges are rifle-rated and can handle all calibers up to but excluding 50 BMG. Our air-handling system is the ONLY government-approved air handling on the market today and is fully conditioned, maintaining a perfect 71 degrees year around. 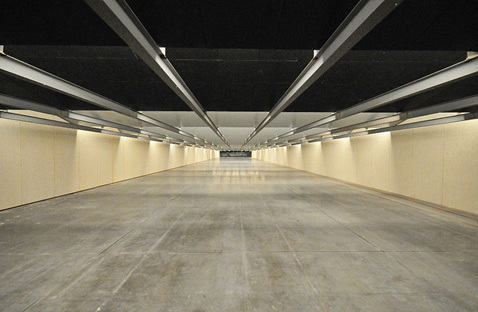 The 100-yard range is equipped with longer custom shooting booths, spaced 60” on center with ambidextrous shooting benches and additional sound-proofing material, making it more comfortable to shoot those larger caliber precision rifles on our indoor range. Each booth contains live target camera feed back to the shooting booth, so you can see where you are hitting without the use of a spotting scope. Only rifles are allowed on the 100-yard range, handguns are prohibited. We always have at least one range open to the public. However, be aware that during our slower times, Monday through Friday, 9:00am to 2:00pm, some of the ranges may be used for agency training. Please check our calendar for these times when certain ranges may not be available. Again, we ALWAYS have at least one range open to the public 7 days a week 9:00am to 9:00pm.